Biography: Tanguy was an officer cadet in the French Merchant Navy, like his father. 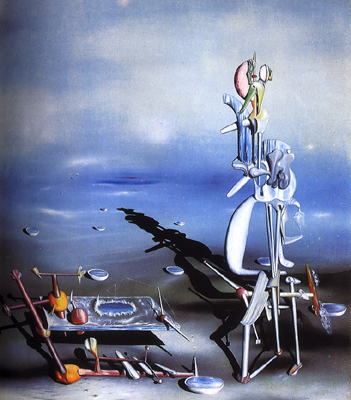 In 1925, Tanguy and his friend Jacques Prevert both joined the surrealist group. His worked fell into three stages. There was the aerial universe between 1926 and 1930. From 1930 to 1948, he painted stretched of beaches littered with minerals. In 1939, he moved to America with his wife, Kay Sage, and was naturalized in 1948. Thus began his third period, identified by the piling up of stones in his paintings, and the illustraion of a submarine world. After 1950, his third period began to include very large paintings. Imaginary Numbers (1954) was one of his last paintings. Six years after his death, his wife, also an artist, committed suicide.